Rising damp occurs due to a defective damp proof course or where none was installed when a property is built, this allows moisture from the ground to rise up. Kenwood were called to a mid-terrace house in Ruislip following concerns of dampness affecting the front bay. 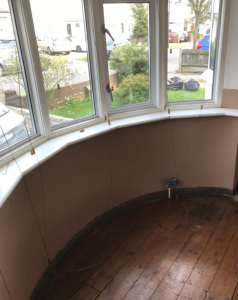 Treatment for rising damp required the removal of wall plaster under the bay window. 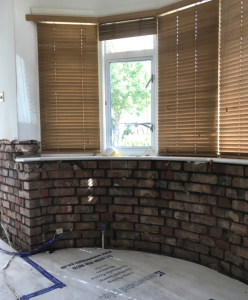 The exposed brickwork was then injected with a new chemical damp proof course. The bay wall was then replastered using plaster which included salt inhibitors and waterproofers. The works are completed with a skim finish to provide a beautiful smooth surface for redecoration once dry.